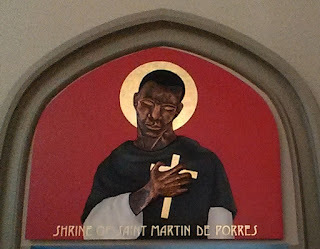 About 20 years ago, I read a biography of St. Martin de Porres to my youngest daughter. St. Martin was admirable in many ways, but there was one story about him that touched me so deeply that ever since then, he has been my favorite saint. Once when his priory was in debt and in danger of having to close, Martin begged his superiors to sell him into slavery to get the funds they needed. Thankfully they refused, but how does one begin to understand such detachment from one's own well-being, such humility? Being pretty much attached to my own self-preservation, I can't help but be humbled before him. Later, I guess it was about 10 years ago, I attended a retreat given by Fr. John Horgan, who has a really incredible degree of knowledge about saints and their stories, and about people who are in the midst of the canonization process. During the retreat, He gave everyone a copy of the holy card that you see in the picture. There's a third-class relic in that little red circle on the bottom right. I don't know why, but the minute I looked at this picture, I fell in love with this woman. 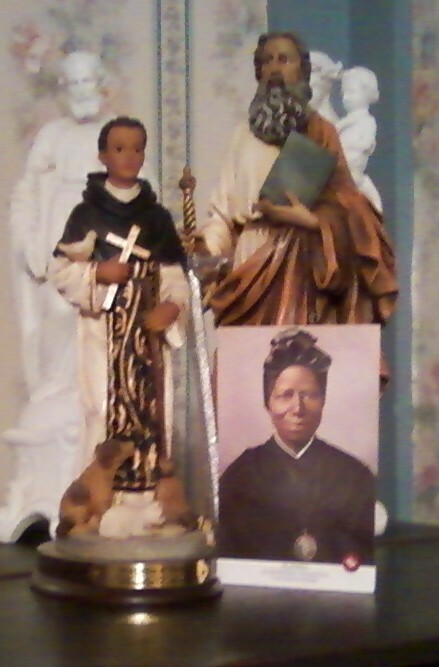 Before Father gave us these cards, I had never heard of St. Josephine Bakhita, who had just recently been canonized. Born in the Sudan, Bakhita was kidnapped by Arab slave traders when she was about 8. She was forcibly converted to Islam, and was sold to a series of owners who treated her very badly. Finally, she was bought by an Italian who treated her well, and then two years later to an Italian family who needed a nanny for their daughter, Mimmina. During a transition in the family, she and Mimmina were left in a Canossian convent in Italy, where Bakhita learned the Catholic faith. When it came time for her to leave, she wanted to stay and become a sister of the order, and because slavery was illegal in Italy, she was able to do this. Now I said all that in order to say this. Yesterday, on my way to Mass, I was thinking about several things, one of which was that I hoped I had made the right decision about the job. And then, I thought about these two, my favorite saints, who were both doorkeepers in the religious communities in which they lived. They were the first to welcome people to the monastery, and the convent, and both of them were known for their hospitality and concern for all those who came. It dawned on me all of a sudden that they are the perfect patrons for someone in my position. I will be the first person that people see when they come to the parish office, and the welcome they get from me will color their whole impression of their visit. The Holy Father spoke of this in his homily on May 25. It was nice of him to think of me like this. I should probably print out the article and read it every morning. I wrote about 90% of the above two days ago, and this is the first chance I've had to finish it. I've been busy training my replacement and trying to finish all the things I need to finish. Today was my going away party because even though I will work through Wednesday, the other woman in my department won't be there next week. Also, my boss won't be there Tuesday and Wednesday. This is going to be very strange. Well, I just posted this and then realized I hadn't mentioned St. Paul. I've never thought all that much about St. Paul. Of course, I've read everything he ever wrote several times, and heard it read at Mass many, many times, but I've never had a great, or even a tepid devotion to him. However, when we had the year of St. Paul about five years ago, I bought the statue in the picture, and we bought some study guides on his epistles which we never opened. Still, there he was watching us from the piano all those years, and Tuesday I noticed that there is a big painting of him directly over my shoulder every week when I go to Mass at the cathedral. So, maybe this job at his parish has been in the works for a long time. The picture, by the way, is of his beheading. I hope that's not an indication of what I have to look forward to.